The Leiden Sarin International Air Law Moot Court Competition is a unique opportunity for students seeking to gain experience in the development of arguments in the field of international law and international air law, while also establishing contacts around the world. The Competition held from 7-10 April 2016 in Jakarta, Indonesia. The case involved questions of public international law and international air law. 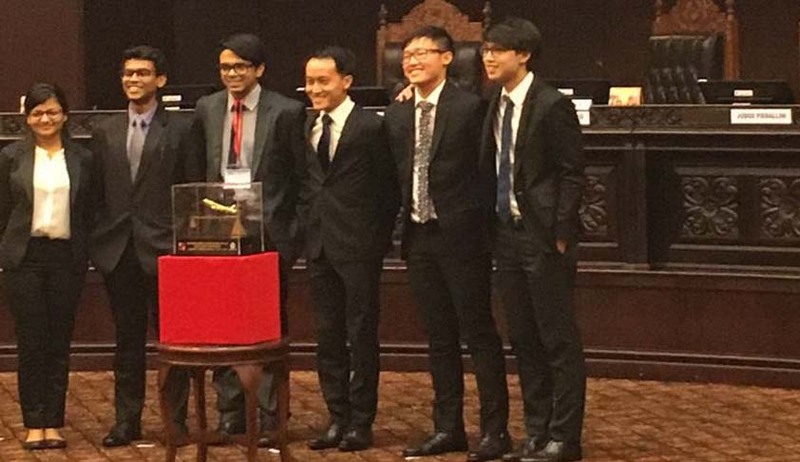 The team comprising Charu Singh, Abhishek Dwivedi and Aj Agrawal from RMNLU, Lucknow defeated the team from National University of Singapore in the final round to win the 7th Leiden Sarin International Air Law Moot Court Competition (world rounds) held at Jakarta, Indonesia. Aj Agrawal was also adjudged Best Speaker at the competition. Live Law: First of all, congratulations on your victory! How does it feel now? Team: Thank you! It feels both wonderful and bizarre to have had the opportunity to represent our country at such a prestigious competition. It has truly been the experience of a lifetime to be able to bring the trophy back to India. We are humbled and inspired by our experiences in the competition and look forward to seeing what the future holds for us. Live Law: How did you get to choose the moot in the first place? Team: We chose Leiden primarily because it’san international law moot. As a team and as individuals we have pursued a number of International Law moots through Law School. Aj & Abhishek have previously participated in the Manfred Lachs International Space Law Moot Court Competition where they were Quarter Finalists at the Asia Pacific Rounds and all three of us have participated in the North Rounds of the Philip C. Jessup International Moot Court Competition. Keeping that trajectory in mind, we actively chose to do Leiden as it deals with a very niche & fascinating area of international law i.e. International Air Law. There is very little literature or exposure in mainstream legal education to International Air Law a burgeoning and increasingly essential field of law. It is particularly relevant given the contemporary state of international civil aviation and the number of aircraft related incidents occurring worldwide (such as the downing of Flight MH-17 in 2015 upon which our moot problem was based). Live Law: How did the preparation undergo? How did the team go about the memorial research, drafting and oral pleading stages for both Indian as well as International rounds? Team: In all honesty, despite having spent a number of months preparing for the moot, we were, as even the most confident mooters secretly tend to be, insecure about our memorials. At the end of the day, this is a competition and even your best research is only good if it’s better than someone else’s best. In a moot such as Leiden, there is always a need to maintain a certain balance between the use of general international law and specialised international law that affects the issues in the moot problem directly. In fact it is the harmonious construction of the two that makes for a holistic and impressive memorial. In international law moots such as this especially, the relationship between the general principles of international law and their relationship with the special legal provisions of Air Law and their analysis is what will ultimately determine the quality and depth of your critical arguments. It is imperative to not only showcase your knowledge of the law (through extensive research) but also to engage the law actively with the facts of the issue at hand in a way that is clear, concise and convincing. After the finals of the World Rounds, some of the judges were gracious enough to tell us that our application of international law had been particularly advantageous to us. Live Law: How was it working like a team? What was the team strategy? Team: Teamwork is fundamental to the mooting process. As a team we divided the issues between ourselves to research upon but we were sure to set some ground rules first. We gave each other the space to conduct our own research, but were sure to constantly keep the others in the loop regarding the formation of the arguments and any developments in research. We made sure that whenever one of us visited a library outside our university, they would carry with them propositions from the other teammates to collect research on. We made it a habit to have each one of us periodically present our arguments in their raw form to the others who would then proceed to test the strength and logical consistency of the arguments. That is not to say that we didn’t have oral mock sessions ourselves. We recorded our speeches during mock sessions and then played it back to ourselves taking note of even minute discrepancies in diction, accent and timing. Considering how judges at international moots are of different nationalities speaking different languages, this really helped us present our arguments orally in a neutral but objectively understandable way at the international rounds. Live Law: Which was the most memorable moment while preparing for the moot? Team: The whole moot in itself has become a memory etched fondly into our minds, but if we had to pick, it would be the Embassy Dinner and the Gala Dinner that the organisers were gracious enough to put together for us. Leiden is a meticulously organised moot.It hosts its participants with such kindness and warmth that we as mooters have not experienced elsewhere. Right from the accommodation to the release of scoresheets, Leiden has been wonderful to us. On our first night in Jakarta, the organisers held a special dinner at the Dutch Embassy where all the participants and judges alike had a chance to engage in lively social interactions. It was a thoroughly splendid affair that allowed us to temporarily forget the harrowing stress of the impending moot and just enjoy the moment. The Gala Dinner after the semi-final rounds was a vibrant, cultural event highlighted by performances of traditional Indonesian dance and music. It was truly enthralling and unlike any other moot court competition we have experienced. In fact it was so enjoyable that when they announced that that we were finalists at the end of dinner, it took us a moment to collect and compose ourselves as we had forgotten about the results of the competition in the revelry of the moment! Live Law: How many teams fought in the moot court competition? Which was yours toughest competition? Team: We won the National Rounds of the moot that were held in Chandigarh where about 17 teams participated. The international rounds however saw 23 teams in the competition from all over the world. A lot of the students from these teams were actually enrolled in postgraduate programmes. Our approach was to treat all teams with equal competitive regard. All the teams we faced were thoroughly prepared and incredibly eloquent in their speeches and we learnt a lot from the different styles in which the arguments were presented. What intimidated us most however was the fact that almost all non-Indian teams had their Coaches (who were usually professors) assisting the teams, while we had never had a coach through our entire preparation process and through to the competition. The toughest team without a doubt was NUS whom we faced in the finals. Their memorial and their speech was beautifully wrought and kept us on our toes the entire time. Live Law: How much of the assistance did your team get from college, seniors and faculty? Team: Our University has been instrumental in facilitating an atmosphere that allows us to work to the best of our potential. Our faculty aside from having taught us the fundamentals of law has been incredibly supportive and appreciative of us. In particular, some our faculty in the final semesters was particularly understanding of our engagement in the preparation process and were gracious enough to give us slightly more relaxed deadlines regarding our submissions. In the midst and at the height of moot preparation, such a relaxation is a no less than a gift from God. Our seniors require a special mention in this regard, because were it not for their help, guidance, constant support and inspiration we perhaps would never have achieved this victory. All of us have previously mooted with multiple seniors who themselves have held distinctions in the international mooting field. They taught us the value of patience and not just consistent but smart hard work while preparing for a moot. They introduced and groomed us about the unique way in which to approach an international law moot. We like to believe that at RMLNLU we have wonderfully well-knit support system of seniors and alumni coaching and helping juniors through the tumultuous arena of moot courts. We are quite proud and grateful of our seniors who provide us with aid in any manner, from research to finding sponsors, without hesitation. Live Law: Who would you attribute your success to win the finals? Team: As is always the case, a number of factors have to come together cohesively for achieving success. In our case, some of these factors were hard work, commitment and dedication to the achieving a set goal. The other factors were the consistent support and wisdom of seniors and our University. Live Law: Any specific tips for the readers on such moots based on a specific area of law? Team: Perfect your fundamentals. Know them and understand them holistically in a way that contextualizes all further law that you study. This requires going beyond the mere necessity of resolving the factual problem at hand. Especially in the field of internationally law it is imperative to understand both from an institutional and theoretical perspective what the general law is and how the specialised body of laws distinguishes itself. Don’t be afraid to get creative in your arguments, so long as you ensure that they remain logically and jurisprudentially sound. Creative arguments set you apart from competitors by showcasing your comfort with the subject. Live Law: What would be your parting message to the mooters of our generation? Team: It is a fantastic time to be a law student and an even more exciting time to be a mooter. There are so new moots on many previously disregarded disciplines of law that we would urge anyone with a passion for critical thought and its expression to pursue the moot that invigorates their mental faculties. Our generation with all its global reach and outlook is on the threshold of a new standard of professional mooting and has every bit the potential to revolutionize it. We thank you for your time !! !